Tim Cook and his mariachis are presenting the new ultra-thin, ultra-light, magical iPad Mini or iPad Air* today at 1pm Eastern /10am Pacific at the California Theater in San Jose. They will probably announce other products too. We'll be commenting it live. Everyone and their dogs have confirmed it. This is what we think we know about the iPad mini:It will have a 7.85-inch screen that's not Retina, an A5 processor and 512MB of RAM. The rest—price, capacity, colors, model—is not certain yet. A latecomer to the rumor party, but it appears that freshened up iMacs may be a real possibility after new iMac product numbers appeared in some retailers' stock systems. Expect a spec bump across the board while prices stay about the same. Don't expect a redesign or a Retina display. Apple would have a separate event for that kind of thing. Same as the iMacs. Although there's a slight possibility that these would get a redesign—it's been long enough. I'm thinking smaller models, perhaps a renewed look. You know, like the latest Airports (though not that small). It would be cool to see ultra small Mac Minis with solid-state drives, but that sounds spendy. Expect these to just pop up in Apple's online store without any fanfare. Don't you think Apple would have a dedicated event to unveil something that major? Us too. Some Twitter people are twittering that this is an event about smaller things and a Retina version of the 13-inch MacBook Pro would fall under that umbrella. We hope so! But Apple has a history of focusing these events on one single major product, mentioning other products' minor updates in passing as garnish. It's unlikely that they would deviate from their core announcement with something as significant as a 13-inch MacBook Pro Retina.We're betting that this announcement would come along side the news that all Macbooks are going Retina—probably next year. But you can always dream! Is This the New 13-inch MacBook Pro with Retina Display? Nothing to see here: this is all about the mini-me iPad, not its giant, mysterious cousin. 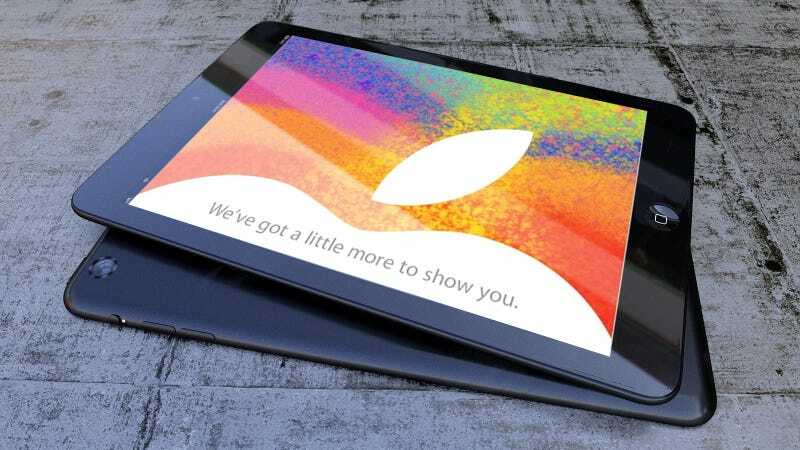 Update: Some people claim that these refreshed iPad images are real. It shows an iPad 3 with a Lightning port but it looks weird. The Apple logo on them seems weird—surrounded by a lighter grey square—so take them with a bucket of salt. As far as I can remember, Apple has never bumped the specs of a product in the middle of its lifecycle (but it's the new Cook Era, so who knows!) Most probably, however, the iPad will get the Lightning port update when the new version come out next year. Is This a Refreshed iPad 3 With a Lightning Port? Apple already announced the new iTunes at the iPhone 5 event. They mentioned an October release. Well, October is about to end and there's an event next week. When Apple's unofficial PR megaphone says it, it's probably true: the name of the reduced iPad could be iPad Air instead of iPad Mini. It makes sense: Air is what Apple designates its thinner and lighter products, and the new teensy iPad will certainly fit that bill. This is not even a rumor—it's just wishful thinking. It would make sense to differentiate their mini tablet from the Android competition, and they would look hot. But not just yet—this is just the first generation of a never-tried-before product. Next year, however, is a better bet. The rumored starting prices go from $250 to $350. I argued in the past that it's probably going to be $250. Some have said that it couldn't possibly be that cheap because it would undercut the iPod touch. But the iPod touch is tiny, which means it costs more to manufacture. And they are completely different product categories: People looking for an iPod touch are not going to buy the iPad Mini because of a cheaper price. Those people want to put the iPod in their pockets, not in their backpacks. It seems that Gruber agrees. Update: According to 9to5mac, the iPad Mini "will start at $329." That's what they claim their allegedly "reliable sources" say.